Left: Brazil's Neymar celebrates scoring the opening goal during the 2018 FIFA World Cup Round of 16 match between Brazil and Mexico. Right: Nacer Chadli of Belgium scores the winning goal during the match between Belgium and Japan. Brazil strengthened their claim on the title of World Cup tournament favorite Monday by advancing to the quarterfinals with a 2-0 victory over Mexico. Neymar broke the deadlock in the 51st minute of the game at Samara Arena, sliding toward goal and tapping in after Willian sprinted down the left and fired in a low cross. The goal made Brazil the World Cup all-time scoring leader with 227 goals, surpassing Germany with 226. Later in the day, Belgium overcame a two-goal deficit to beat Japan 3-2. Mexico often threatened Brazil but were unable to withstand Brazil's attacks. 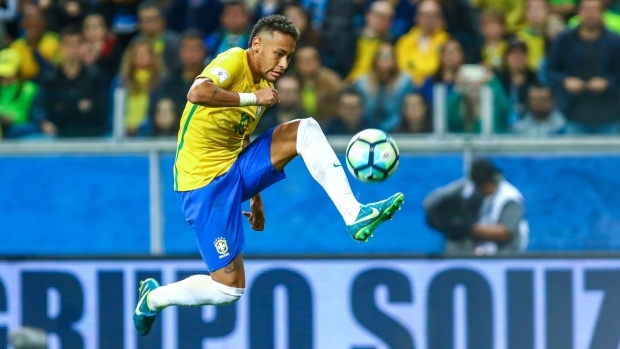 Neymar assisted on the second goal, firing an 88th-minute shot at Mexican goalkeeper Guillermo Ochoa that flew into the path of attacker Firmino, who tapped the ball in. So many favorites have been eliminated already from the World Cup — Germany, Argentina and Portugal among them — that Brazil, trying to make amends for its disappointing 2014 tournament, now has a strong shot at leaving Russia with a sixth title. You've seen him dominate on the pitch, now learn a little more about the Brazilian star. Mexico was seeking the elusive "quinto partido" — fifth game, a trip to the quarterfinals — for the first time since 1986. El Tri had made it to the round of 16 for the past six tournaments, only to stall out at that stage. Mexico was unable to pull of a similar upset to their 1-0 victory over Germany in the group opener, its first victory over the four-time champions in a competitive match. Thirty-nine-year-old Mexican defender Rafael Marquez became the first player picked in a starting 11 at five World Cups. 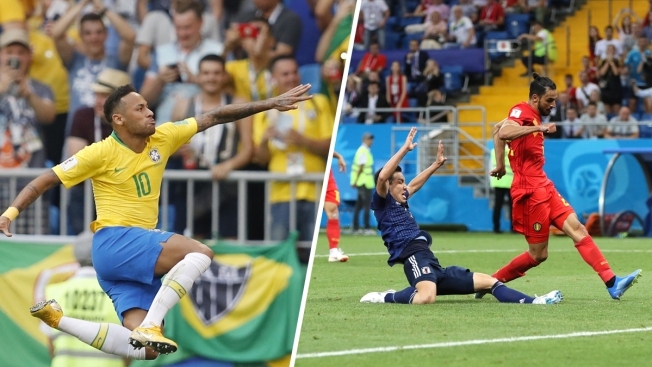 Belgium rallied from 2-0 down to beat Japan 3-2 with a goal in the dying seconds and advance to a World Cup quarterfinal match against Brazil. Nacer Chadli finished off a length-of-the-field movement late in stoppage time for the clincher on Monday night at the Rostov Arena. It's the first time since 1970 that a team has rallied to win a knockout game from 2-0 down at a World Cup. Jimmy Fallon turns viral World Cup photos from the week into memes. Midfielders Genki Haraguchi and Takashi Inui scored in the 48th and 52nd minutes to give Japan a surprising 2-0 lead. Jan Vertonghen started the comeback when he scored with a looping header in the 69th and another substitute, Marouane Fellaini, headed home Eden Hazard's cross from the left in the 74th. What was expected to be a mis-match ended up to be a classic match. Belgium was one of only three teams to win all three group games and topped the tournament scoring list with nine goals in the group stage. Japan narrowly scraped through to the knockout stage in the tightest of tiebreakers against Senegal — after both teams finished level in Group G — because it had a better disciplinary record at the tournament. 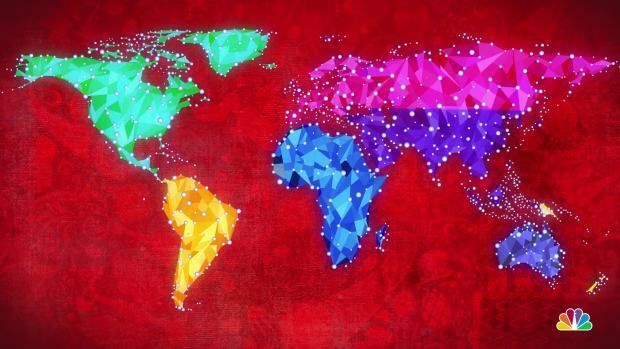 Japan has now lost in the round of 16 three times and has never reached the World Cup quarterfinals.